A Duluth maker of outdoor gear plans to introduce duffel and shell bags made of material formerly used in the roof of the Hubert H. Humphrey Metrodome. The bags will be made by Duluth Pack, but they won't be cheap. The duffel bag is listed at $485 and the shell bag at $160, the Duluth News Tribune reported. Jim Cunningham, an announcer for the Minnesota Twins, and Tim O'Phelan, the son of a longtime Twins physician, bought the entire inner layer of the Metrodome roof after it collapsed in 2010. They spent $4,000 for the Teflon-coated fiberglass, which has an area of about three acres. "You can't rip it. It's waterproof," O'Phelan said. Despite its durability they weren't sure what to do with it. They stashed it in a storage facility in central Minnesota until they could figure out a plan. Eventually O'Phelan toured a leather factory and noticed the raw materials there seemed similar to what they had. That gave him an idea. 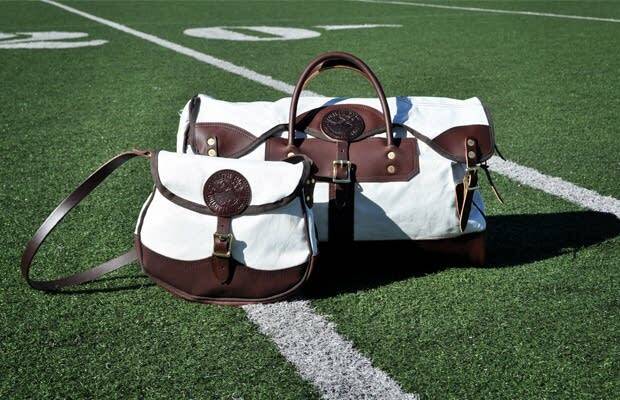 He and Cunningham approached Tom Sega, the president of Duluth Pack, suggesting the lining could be used to augment the company's line of heavy-duty bags. Sega liked the appeal of incorporating a piece of a historical Minnesota building. He also liked how rugged the material was. "It's tough as nails," Sega said, noting it was good for cutting, sewing and riveting. "We found it very durable." Duluth Pack says the bags are a limited item. They're available online and at the Duluth store in Canal Park. Sega said the company plans to use the entire inventory of roof material. He predicted that customers will include professional athletes who played in the Metrodome. The stadium opened in Minneapolis in 1982 as the home of the Twins and Vikings. It has hosted numerous concerts and monster-truck rallies, along with a Super Bowl, two Final Fours and two World Series wins for the Twins. "What took place under this roof will never be duplicated again," Sega said. After the coming Minnesota Vikings season, the Metrodome will be torn down and replaced with a new stadium. The initial plan for the old roof was to dump it in a landfill. O'Phelan said he was glad he and Cunningham were able to come up with a entrepreneurial use for it instead. "We were told it would take 1,500 years for (the fabric) to decompose," he said. "This is a green story as well."